theomagica - The Golem is alive. The term 'synchronicity' was established by the famous psychologist Carl Gustav Jung. It describes a series of seemingly unrelated, coinciding events which, however, taken together create a specific meaning in the person's mind who is experiencing them. E.g. we read of Odin and get distracted because of a flock of ravens descending into our backyard. Or we get a series of magical letters tattooed on our chest - and on the very same day 'happen' to walk through the doors of the world's largest exhibition on the Golem. See, the problem with placing a psychological term on anything (which psychologist of course LOVE doing, almost as much as mages) is that it buries an actual real live experience underneath a cognitive label. Suddenly we are not encountering our own emotions, our own thoughts and associations any longer - but we are caught in a category. This is a trick of consciousness that psychologist leverage with great positive impact e.g. to treat depression. But in other contexts it can quickly turn into a trick of avoiding responsibility for one's actual inner experiences. The term 'synchronicity' is a great example of such a psychological trap. We all know, nature doesn't do math, psychology or philosophy; nature is all into the business of creating first-hand, real-life experiences. How we decide to make sense of these seemingly unrelated experiences is what shapes our present, past and future lives. If, however, we unconsciously delegate this agency of 'sense making' to a third party - whether that is mathematics, science, psychology, or a 'corporate religion' - we outsource the very process of shaping the person who we will become. We literally abandon ourselves; we agree to turning ourselves into Golems. In the above case it would be psychology placing letters on my chest - rather than me maintaining interpretational sovereignty over my spiritual experiences. Rather than getting unconsciously trapped in this process though, as mages we can also consciously choose to leverage it. In rare and carefully selected situations we might actually choose to turn ourselves into a golem. Not to everyone of course, but to a specific being who we then accept as our own co-creator. Such was the case when I got the spirit's name tattooed on my chest - just like the golem was brought to life when its creator wrote the word 'ameth' on its chest. In the most literal sense I signed this spirit pact in my own blood. The promise of this pact was for me to accept a part of my nature as a golem. That part is now bound to inhale the 'life' which this spirit breathes into me. It is bound to be clay in the hands of this entity. That part is bound to walk into the circle I am being conjured into, rather than to conjure myself. -- Or maybe both is happening at the same time - establishing a relationship of true reciprocal equality - like any good pact does? Anybody who has studied the medieval commentaries on the Sepher Yetzirah or Abulafia's most complex Hebrew letter permutations, knows by heart what kind of skill, experience and perseverance the creation of a golem requires from its creator. Equipped with this knowledge - as always in magic - we can choose to look at this reality from both sides of the mirror: Will we attempt to perform such highly advanced act of magic on a liveless form ourselves? Or will we call on a spirit to perform it on us? In other words, does this magical knowledge call upon us to become the creator - or to become the created? What is the more relevant challenge to us - to subdue or to be subdued? To turn ourselves into clay, or into the hand that shapes it? Maybe for a moment let's change our viewpoint. Let's look at ourselves through the lens of a spirit beyond the circle of the Moon: Suddenly we are beings that come and go within the blink of an eye, we blur with time and space and so our bodies blur with our days, our presence and our past. 'Writing' on us means writing on our bodies, just as much as it means writing into our time, our days, our presence and past. From such 'elevated' viewpoint the line between our feet and the earth is highly instabile and so is the line between our lips and the sky. All that matters from this vantage point are the experiences we are exposed to - whether written on our bodies or into our days and nights. Understanding this, living in acceptance with the fact that this is how daemons interact with us, that we are their golems to a large degree, and that striking a pact with them sometimes is the best we can do in becoming co-creators to them, all of these are the lessons we learn from actual ritual magic. And all of this is what a term such as synchronicity can steal from us - by letting go of our subjective experience in exchange for a dead, objective label. Exhibition in the Jewish Museum of Berlin. To honour my own golem-experience this week, let me give something back. Let me share a few of the many highlights of this extraordinary exhibition in the Jewish Museum of Berlin. Should your travel schedule allow, under any circumstances, I strongly recommend paying a visit to this special place before the end of January 2017. (1) The installation 'My light is your life' by Kristof Kindera is precisely illustrating the complex creator-creation-pact relationship I tried to explain above. Standing in front of this illuminated piece of art we are turned into the role of the Golem ourselves: Which light is it we decide to put ourselves under? Whose light is it that we accept to shine our path and journey? 'My light is your life'. As human beings, free of choice, we are encountering one of the most difficult questions in light of our own Golem-God-nature. 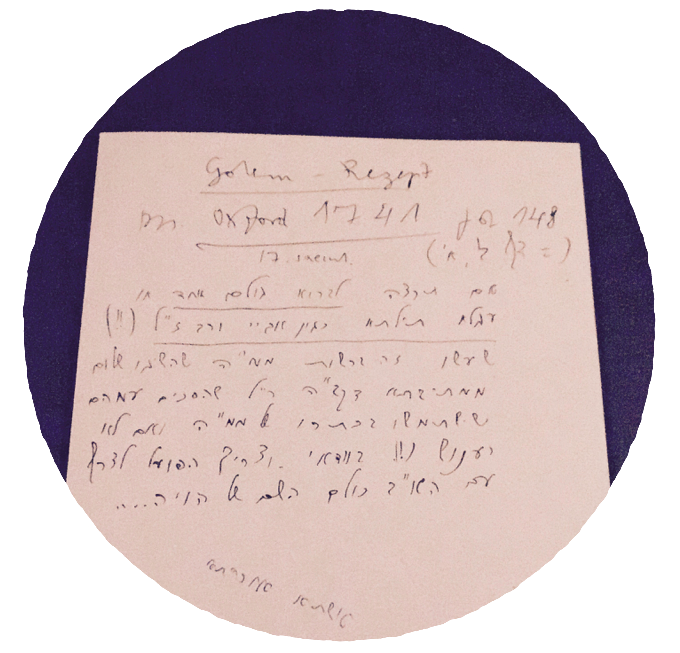 (4) Looking at the more traditional exhibition items we come across a small note written by Gershom Scholem. It is simply titled ‘Recipe for Golem’ and contains the transcript of an anonymous 17th century manuscript: “(…) when you form the body, you call the shape aleph just like I showed you. And when you make the bowels combine the letter mem; and when you make the head combine the shape of shin; and when you form the mouth combine the letter bet; for the right eye the shape gimel, for the left eye he, for the nose kaf, the left nose pe, the right ear resh, left ear taw, right hand he, left hand waw, right foot sain, left foot chet, right kidney tet, left kidney jod, liver lamed, gall nun, melt samech, stomach ain, gullet zade, navel kof (…)”. (5) A hint to to deciphering the above recipe can be found in another showcase. Here we see a copy from the turn of the 16th century of a manuscript by Eleasar of Worms - one of the most famous Jewish mystic to provide explicit instructions on how to create golem in his commentary on the Sepher Jezirah. The book contains Hebrew letter blocks of permutations which resemble the mystical instructions given by Abraham Abulafia from the 13th century. It is these kinds of seemingly endless letter permutations that formed the basis of the magical act to bring to life a lifeless form. Scholem’s recipe for a golem refers to them by indicating to ‘combine’ a certain letter when creating a certain body part of a golem. If you are interested to learn more about the highly advanced magical practice of golem creation, the essential sourcebook can be found in Moshe Idel’s ‘Golem: Jewish Magical and Mystical Traditions on the Artificial Anthropoid’. (6) Right in the centre of one of the main exhibition rooms we find a larger than life statue stretched out on the floor. It is Joshua Abarbanel’s 2016 work, simply labelled ‘Golem’. The entire body of the being is made up of hundreds of letter pairs cut from wood - always repeating the pattern ‘mem’ and ‘tau’. Together they form the Hebrew word for death. In the heart-space of the sleeping giant, however, we find a gap in the shape of a large ‘aleph’. And looking closer even we also see a large wooden aleph chained around the beings neck. In a very graphical form here we encounter the heart of the golem story: According to an apocryphal story IHVH had created man by placing the three letters ‘aleph, mem, tau’ on his forehead. Together these letters from the Hebrew word ‘truth’ (emeth). When IHVH considered killing Adam he would only need to wipe out the alpha from his forehead - and the word ‘death’ would all that remained on his body. It is this legend that is essential to the medieval lore about the Golem. And in Abarbanel’s work it comes to life in a magical way - illustrating the hybris of man in trying to control his own creation with a single letter permutation. 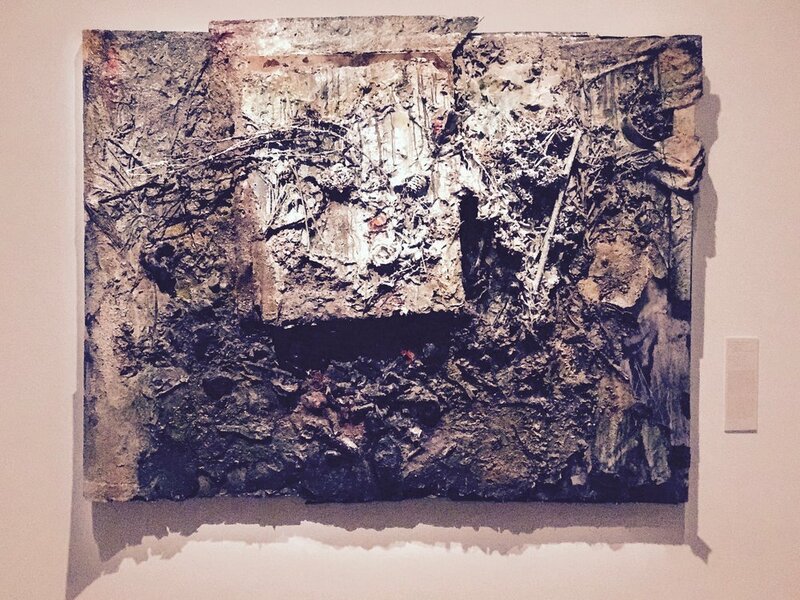 These are only six examples of the vast body of work this fabulous exhibition covers. Other highlights range from a magical statue of Rabbi Löw by Leonora Carrington, the original lithographs of Gustav Meyrink’s seminal novel ‘The Golem’ by Hugo Steiner-Prag, a collection of life-sized theatre stage-golems all the way to the massive three-cinema-screen installation by Stefan Hurtig and Detlef Weitz ‘AE/MEATH’ - with material taken from over 60 movies relating to the themes of the golem lore. It is fair to say, the Golem is alive. And these days it walks the streets of Berlin.